The Ioway chief known as Na-Che-ning-a or Notchininga (No Heart of Fear) was the uncle of his predecessor, Mahaska II (White Cloud). Mahaska's father, also Mahaska [1784-1834], died in 1834 and the hereditary position fell to the son. A member of the leading Bear Clan, White Cloud served as second in command to Mahaska II and chief speaker for the Ioways beginning in 1848. He became head chief after White Cloud died, in December of 1851. According to Ioway legend, the tribe was founded by four animals, brothers, who became human beings. Leadership was hereditary in Ioway government, passing along the male descendants of the four main clans (Bear, Buffalo, Pigeon, and Elk). If a chief died, his eldest living son succeeded him, and if he had no sons, his daughter's son or niece's son followed. 1837 Charles Bird King painting. 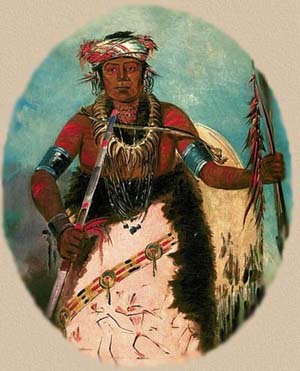 Civil matters were conducted by the two most important clans of the Ioway, the Bear and Buffalo clans, who were said to have founded the tribe. The Bear clan ruled during the fall and winter, and managed the hunt; while the Buffalo clan ruled the spring and summer, managing the corn planting and harvest. When traveling, a leader of the day was selected, to take care of the tribe during the day, and to select the campsite for the night, making sure it was secure. 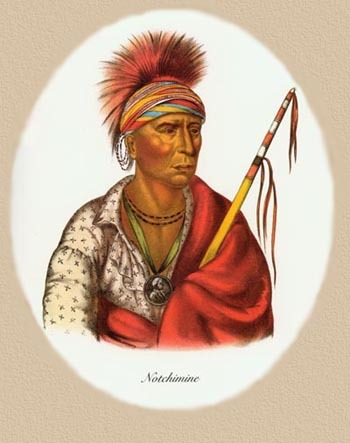 As a Bear clan leader of the early 19th century, and like his nephew White Cloud before him, No Heart of Fear was much involved in the business of treaty cessions and the complex and difficult changes in the society caused by the growing influence of the Euro-Americans. He was involved in negotiations over several treaty cessions; his first trip was the 1837 council for which the map was produced. 1926. Ethnology of the Ioway Indians. Bulletin of the Milwaukee Public Museum Volume 5. Milwaukee. Portrait by George Catlin, early 1830s, Smithsonian Institution, Washington, D.C.